Alex Horne Chiropractic – Page 2 – London Chiropractor for athletic and sedentary warriors. Rowing and leg press machine warning! It appears ‘tis the season to slip a disc in London. Our Chiropractors have seen a string of disc injuries recently, relating to rowing and leg press machines. Any position which creates high or repetitive forces to the lower back whilst bent forward puts your discs at risk of prolapse or ‘slipping’, such as with rowing or leg press. Bear in mind that you could be doing damage before you feel pain, especially if you’re not stabilizing yourself correctly. Over time, cartilage fibers lose their strong criss­cross pattern and become aligned, making them weaker and more at risk from tears or ‘slips’ (Check out more about discs). Warming up properly with some gentler body weight exercises will help guard against these injuries, however, technique is fundamentally important for both activities. If you’re not sure how to do it, seek professional advice and in the mean time don’t push them too hard! Leg press especially starts you off in a more difficult position, squats are safer because you will begin in a safer posture, i.e. standing. If you need help or advice, you know where to find me. Alex Horne Chiropractic – ­ Don’t let it slip! Make a stand in the morning! Many back pain sufferers know that catching 40 winks can be tough for your back. 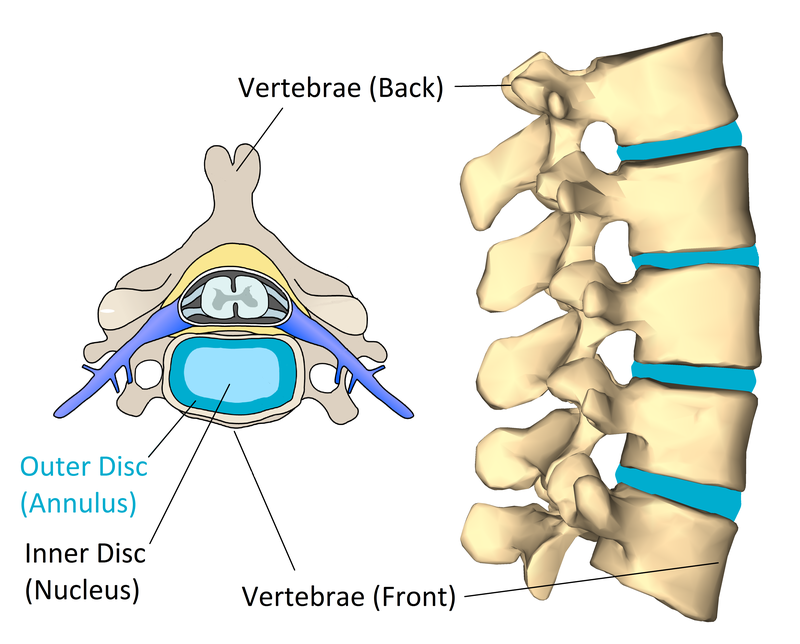 Between your vertebrae, there are discs made up of fluid and strong fibres helping to distribute pressures on the spine, for example during sitting, bending or running. During sleep, the load on our spine is relieved, giving our discs a window in which to heal and hydrate. In the morning a typical spine is 1-2cm longer* (this can be up to 5cm in space! *) as hydration causes them to expand. These lofty heights are lovely, however more fluid in the disc creates a pressure increase. Bending in the morning produces approximately four times more strain than during the day**, putting you at a greater risk of injury. Discs have a poor blood supply, so rely upon rehydration and protein replenishment to stay healthy. Of all cartilage in the body, they wear down the fastest*, so ignore them at your peril! We are largely immobile when asleep, so the facet joints, which are designed to move, can also feel stiff on waking. (Problems aren’t usually caused, but accentuated by sleep). Mornings are quite a delicate time. Your discs need to depressurise without being subjected to heavy strain or big stretches, but, at the same time, your facet joints like to be stretched out. The best advice is to slowly expose your back to you body’s weight before subjecting yourself to any stressors. Continue reading Make a stand in the morning!